Liszt’s most consummate work for piano – a unique study in thematic transformation, an essay of complex structural organization, of wondrous tonal insights and enigmatic harmonic manifestations, of molten no less than fragile keyboard layout – the Piano Sonata in B minor (1851–1853) was first performed in public in Berlin by Hans von Bülow (Liszt’s pupil and son-in-law) at a concert given on 22 January 1857 to inaugurate the first grand piano to be made by Carl Bechstein. ‘An unexpected, almost unanimous success … completely [dumbfounding] the cretinous scoundrels’, was Bülow’s verdict to the composer. Liszt dedicated it to Schumann. 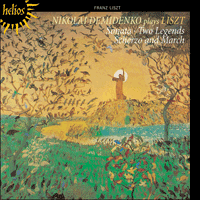 Tonally, Liszt explores tensions at once Classical, Romantic and futuristic. He is at his most Classical in the ‘exposition’ and ‘recapitulation’, with first and second subject groups initially in the tonic (B minor) and relative major (D), and latterly in tonic minor and major. Likewise, his ‘Andante sostenuto — Quasi Adagio’ (on a theme sketched in a notebook of 1849) is broadly in F sharp, the dominant. However, how he travels between and contextualizes these keys shows him in essentially Romantic light: for instance, in the ‘exposition’, the ‘flat’ orientation of the transition between the B minor agitato of the ‘Allegro energico’ (a combination of the second and third themes of the work) and both the D major ‘Grandioso’ idea (the ‘ardent virtuoso, head thrown back’ tune of Walter Beckett’s biography, 1956) and the ‘Cantando espressivo’; the ‘flat’ A major and ‘sharp’ G minor operatic interpolations of the ‘slow movement’; the B flat minor key of the ‘Scherzo-fugato’ (a section whose duple time signature and short staccato seem to remember the Beethoven of Op 31 No 3); and the heroic, volcanic importance of E flat major. Programmatically, Liszt provides us with no clues as to the character or meaning of his themes. As Searle confirms, ‘the B minor Sonata … does not attempt to tell a story’. However, from the evidence of his students (who, according to his grand-pupil Claudio Arrau, took the fact for granted), the example of Alkan’s earlier Quasi-Faust published in Paris in 1847 (with which the B minor shares – to the point of even occasional plagiarism – strong melodic, structural and conceptual ties, including a fugue), and the thematic/descriptive proof of his own later Faust Symphony, we may assume them to have general associations with the Faust, Mephistopheles and Gretchen story of Goethe’s drama, all traceable in one guise or another. In Arrau’s view, ‘I think of the Sonata as a great Faustian tone-poem, with Gretchen, Faust and Mephistopheles all playing out their archetypal roles of transcendence, redemption and negation’. Brendel, while admitting it does not need a programme, also likens its macrocosm to a ‘Faust-Mephisto-Gretchen constellation’. Brahms, like Clara Schumann, failed to appreciate it. Hanslick ravaged it (‘this musical monstrosity’). Sitwell could find no enthusiasm. But Wagner celebrated, joyously: a work ‘beautiful beyond all conception; great, lovely, deep and noble, sublime even as thyself. I feel most profoundly moved …’ (London, 5 April 1855). He lifted up his eyes and saw the trees which stood by the wayside filled with a countless multitude of birds, at which he marvelled and said to his companions: ‘Wait a little for me in the road, and I will go and preach to my little brothers the birds.’ And he went into the field, and began to preach to the birds that were on the ground, and forthwith those which were in the trees came around him and not one moved during the whole sermon, nor would they fly away until the Saint had given them his blessing. The second (in E major) is about Francis of Paola (Liszt’s patron saint), the Calabrian who is said to have walked across the waters of Messina, his cloak spread before him like a sail. In it the sea veritably roars and thunders, Francis’s theme rising out of the deep, weathering the storms and whirlpools of Scylla and Charybdis finally to bid us farewell in a miraculous blaze of celestial light and glory. New evidence suggests that both pieces were written originally for orchestra, in which form they were premiered in Berlin in October 1982. Described in the autograph as a ‘Concertstuck [sic] für das Pianoforte’, the Scherzo and March, dedicated to Theodor Kullak, court pianist to the King of Prussia, appeared in 1851. A hellish ‘night ride’ of extraordinary dimension and sustained originality, inflamed by a pianism of colossal, high speed, rhythmic athleticism (a relentless onslaught of brittle digital dexterity, or massive block and quasi trillo chords, of muscular double-octave thunder, all unleashed within a dynamic spectrum of pp to fff, and all directed towards the creation of a texture frequently bizarre in the Alkanesque spacing of its extremes), it belongs among the least familiar of the great Liszt epics. Physically exhausting, emotionally draining, re-creatively challenging, the enormity and terror of its pianistic universe are not for the faint-hearted: to survive its galvanic journey is to knowingly triumph over some of the most awesome difficulties in the entire history of Romantic piano technique. Like the 1838 version of the Transcendental Studies, what it documents, memorably, is a wholly new kind of energizing virtuosity. Architecturally, Louis Kentner has observed (1970), the Scherzo (in D minor) – in the tradition of Beethoven’s Ninth, a work Liszt knew intimately – is in sonata form, prefaced by an introduction, ‘Allegro vivace, spiritoso’. More a seed-bed of atmospheric invocation than germinal melody, this introduction, whispered and mocking, is concerned broadly with a staccato left-hand figure of Second Concerto-like identity. Precisely delineated, on-going in elaboration, the main thrust of the exposition revolves around two principal subject groups. The first of these, macabre and underlined by an unrelieved mood of nocturnal hellishness, polymetrically juxtaposes material in 2/4 and 6/8; the second, arrestingly unisonal, is in the dominant minor. Preceded by an exegesis combined of elements drawn from the second subject and introduction, the development section, a scena of cinematically diabolonian encounter, dwells amid fantasies of burgeoning spectral shape and sound. Opening with a flashback to the introduction (by now an important signpost) and punctuated by ‘presto strepitoso’ episodes of malignant Mephistophelian laughter, its substance is established by fragments of the first subject (in B minor) offset by an angular fugal interpolation anticipative in many ways of things to come in the sonata and the Faust Symphony. For musico-dramatic reasons, the recapitulation, heralded by a prestissimo re-transition, is curtailed. The central March, ‘Allegretto moderato’, is in B flat, but it’s an adulterated B flat, coloured by an insistent minorially flattened sixth that intonationally is to the immediate context what B flat tonally is to the whole. Liszt gives us a magnificently idiomatic and personal vision, a grand march of the spirit. True, his models are discernible. On the one hand, Beethoven: the key and style of the ‘Alla marcia’ variation from the Ninth’s finale. On the other, Weber: the crescendo by repetition, the climax, the sudden decay of the march from the Konzertstück (an old repertoire stomping ground). But what he does with his material is unique to himself: for example, how he excites sudden shifts of key – from B flat mp to B flat ff by way of G flat, D flat, E, D and C sharp, plus some inevitable augmented triad referencing – to create tension and impulsion. And how he re-harmonizes the March theme on its final fff marcatissimo appearance to set the whole instrument suddenly roaring in a resonance of clangorous, fearful tumult. The final third of the work is occupied with a partial recapitulation of the Scherzo (a reprise of the first subject in D minor) and a closing coda-development in the Beethoven manner, ‘Stretta’, based on fragments from the March in conflict with the second subject of the Scherzo twisted into the tonic major (D) but with the flattened-sixth (now B flat) and flattened-second (now E flat) inflexion of its original minor key presentation retained. ‘It is’, Kentner says, ‘as if religion [the March (God)] were doing battle with the Devil [the Scherzo].’ This major/minor confusion is maintained right to the end. Even when D major seems to be unequivocally proclaimed, a B flat irritant makes sure that it isn’t quite. La Sonate en si mineur (1851–1853) – une formidable démonstration de transformation thématique, une structure complexe d’une étonnante finesse tonale et aux inventions harmoniques mystérieuses, réclamant de l’interprète un jeu d’une fluidité fragile – est l’œuvre la plus achevée qu’ait jamais écrite Liszt pour le piano. Dédiée à Schumann, elle fut exécutée pour la première fois le 22 janvier 1857 à Berlin sous la direction de Hans von Bülow (alors élève et gendre du compositeur). Il leva les yeux et vit dans les arbres qui bordaient la route une innombrable multitude d’oiseaux; il s’en émerveilla et dit à ses compagnons: «Attendez-moi quelques instants sur la route, pendant que je vais prêcher mes frères oiseaux.» Après quoi il pénétra dans le champ et commença à prêcher les oiseaux qui se trouvaient sur le sol; aussitôt, ceux qui étaient dans les arbres vinrent se poser autour de lui et aucun ne bougea durant tout le sermon, ni ne s’envola avant que le Saint ne l’ait béni. Le sujet de la deuxième est François de Paule (le saint patron de Liszt), le Calabrais dont on dit qu’il a marché sur les eaux de Messine, son manteau déployé devant lui comme une voile. On entend la mer rugir et gronder, puis le thème de François qui s’élève des profondeurs, remonte la tempête et les tourbillons de Charybde et Scylla avant de nous faire ses adieux dans un extraordinaire flamboiement de gloire et de lumière céleste. De récentes recherches semblent indiquer que ces deux œuvres furent d’abord écrites pour orchestre, version sous laquelle elles furent exécutées pour la première fois à Berlin en 1982. Le Scherzo et Marche, dédié à Theodor Kullak, pianiste à la cour du roi de Prusse, fut composé en 1851. C’est une «promenade nocturne» infernale, une œuvre très inspirée, de grande envergure, enflammée par un rythme rapide exigeant une grande virtuosité – un assault continu de subtil doigté, d’accords anguleux et quasi trillo, de doubles octaves résonnant d’arrogance, le tout parcourant un vaste spectre dynamique allant de pp à fff, et contribuant à créer une texture assez bizarre dans les écarts Alkanesques qui séparent ses extrêmes. C’est l’une des œuvres épiques de Liszt les plus méconnues. Son univers énorme et terrifiant, épuisant tant au niveau physique qu’émotionnel, provoquant sans cesse l’imagination, n’a pas de place pour le pusillanime: survivre à ce voyage galvanique, c’est triompher sciemment de quelques-unes des plus impressionnantes difficultés techniques de tout le répertoire romantique pour piano. Tout comme la version de 1838 des Études d’exécution transcendante, cette œuvre introduit de façon fracassante un style de virtuosité entièrement nouveau d’où jaillit une grande énergie. Liszts höchstes Meisterwerk für Klavier – eine einzigartige Studie in thematischen Transformationen, ein vielschichtig strukturierter Essay von außerordentlichen tonalen Einsichten und änigmatischen harmonischen Innovationen, von einer nicht weniger schmelzenden als auch fragilen klavieristischen Spieltechnik – die Sonate h-moll (1851– 1853), die Schumann gewidmet war, wurde in Berlin von Hans von Bülow (Schüler und Schwiegersohn des Komponisten) am 22. Januar 1857 erstaufgeführt. Er hob die Augen und sah, daß die Bäume am Wegrand von einer unzählbaren Vogelmenge bevölkert war. Dies erstaunte ihn und er sagte zu seinen Gefährten: „Wartet auf der Straße eine Weile auf mich, und ich werde gehen und meinen kleinen Brüdern und Vögeln predigen.“ Und er ging auf das Feld und begann den Vögeln, die auf der Erde saßen, zu predigen, und alsbald kamen die, die sich in den Bäumen befanden zu ihm, und während der ganzen Predigt bewegte sich keiner von ihnen, noch wollten sie wegfliegen, bevor der Heilige sie gesegnet hatte. Die zweite handelt von Franz von Paola (Liszts Schutzheiliger), dem Kalabrier, von dem gesagt wird, er sei über die Wasser von Messina gewandelt, mit seinem Umhang vor ihm ausgebreitet wie ein Segel. Hier tobt und stürmt die See wahrhaftig, während das Thema des heiligen Franz aus der Tiefe emporkommt und den Stürmen und Strudeln von Szylla und Charybdis trotzt und schließlich in wunderbarem Glanz und himmlischer Herrlichkeit von uns Abschied nimmt. Neue Beweise deuten darauf hin, daß beide Stücke ursprünglich für Orchester geschrieben wurden, und sie wurden in dieser Form 1982 in Berlin erstaufgeführt. Das Scherzo und Marsch, das Theodor Kullak, dem Hofpianisten des Königs von Preußen gewidmet war, wurde 1851 komponiert. Ein höllischer „Nachtritt“ von außergewöhnlicher Dimension und anhaltender Inspiration, entfacht von einer klavieristischen Spieltechnik von hochgeschwindiger, rhythmisch athletischer Gewandtheit (ein heftiger Ansturm von schneidender Tastengeschicklichkeit, von wuchtigen Block- und quasi trillo-Akkorden, von der kraftvollen Arroganz der Doppel-Oktaven. All dies wird innerhalb eines dynamischen Spektrums von pp bis zu fff entfesselt und ist auf die Schaffung einer Struktur ausgerichtet, die oft, in ihrer Alkan ähnlichen Anordnung der Gegensätze, bizarr anmutet), gehört dieses Werk unter den großen Epen von Liszt zu den verhältnismäßig unbekannten. Körperlich strapazierend, emotional erschöpfend und herausfordernd in der Interpretation sind die ungeheure Größe und der Terror seiner Welt nicht für den Zaghaften: diese elektrisierende Reise zu überstehen bedeutet, wissentlich über Teile der eindrucksvollsten Schwierigkeiten der gesamten Geschichte der romantischen Klaviertechnik triumphiert zu haben. Genauso wie die 1838er Fassung der Études d’exécution transcendante, ist das, was es denkwürdig darstellt, eine ganz neue Art energiespendender Virtuosität. Die Musik besteht aus drei Abschnitten: einem Scherzo in Sonatenform (D-moll, 6/8, „Allegro vivace, spiritoso“), dem eine atmosphärisch flehende Einführung vorausgeht; einem Marsch in der Mitte (B, 4/4, „Allegro moderato“) imposant und großartig; und einer Reprise/Koda in der die beiden in einer sich steigernden Konfrontation zusammentreffen – wie der verstorbene Louis Kentner gesagt hat, ein Angriff auf die Sinne, in dem „es ist, als ob die Religion [der Marsch (Gott)] mit dem Teufel [das Scherzo] kämpft“.